An article in the London Daily Telegraph suggesting that President Obama might back a major program of bulldozing parts of cities in the Rust Belt has put so-called “shrinking cities” back in the spotlight. Many cities around the country, especially in the Rust Belt have experienced major population loss in their urban cores which has sometimes spilled into their entire metro area. They have thousands of abandoned homes, decayed infrastructure, environmental challenges, and no growth to justify a belief that many districts will ever be repopulated. 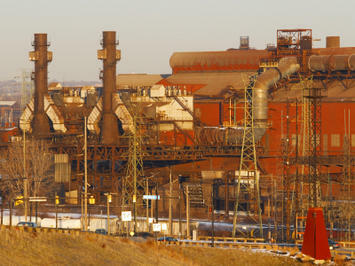 Cities in the Rust Belt grew in an era when large scale manufacturing required large amounts of labor. Today, productivity improvements mean that the United States can set new industrial production records with a fraction of the workforce of yesteryear. With much of its traditional labor force no longer as in demand in the modern economy, many Rust Belt cities lack an economic raison d'etre. Some may transform themselves for the modern economy, but many will be forced to accept the reality of a significantly diminished stature in the 21st century. In this world, size can prove a liability. One of the biggest problems in turning around Detroit is the sheer size of the region. The metro area has a population of 4.5 million – not including nearby Ann Arbor or Windsor, Canada. Is there really any need in the modern day for a city the size of Detroit in Southeastern Michigan? It seems doubtful. As I've argued before, transforming that city's economy would be much easier if the region were smaller. One challenge is that a decline in population, which is already occurring naturally, doesn't shrink the area of urbanization or the accompanying infrastructure that needs to be maintained. Indeed, although it is losing population and can't support the infrastructure it has, Detroit still wants to build more, such a new regional rail transit system. And legacy debts such as pension liabilities don't get smaller just because people leave. As with leverage, scale economics works in declining places as well as on the growing ones. The people who operate new transit systems or police who secure expanded areas must be paid. Roads, sewers, and water lines need to be maintained. In many places that are losing people, jobs, and tax base, such fixed costs could prove ruinous over the long run. Under such conditions, Rust Belt cities require both outside help and a program of managed shrinkage. The first challenge will be getting these cities, especially larger ones like Detroit, to admit that they need to do it on a regional basis. Medium sized cities like Flint and Youngstown have been more willing to face up to challenges. In contrast, places like Detroit, Cleveland, and Buffalo still see themselves as important national cities. Pride is blocking the effort to undertake a major managed shrinkage program. Instead of adjusting to reality, these cities continue to pour hundreds of millions into projects that vainly attempt to restart growth. .
Education. Raising educational attainment not only makes people more employable in the new economy, it makes them more mobile. Relocation Assistance. Many people in the Rust Belt might want to move but be unable to do so because they are upside down on a mortgage or can't sell their house. As more people leave, that will put downward pressure on the housing market. Hence, some government relocation assistance to help buy out people who want to move might be helpful. Shrinking the Urban Footprint. The quantity of urbanized land needs to be reduced so that the excess housing and infrastructure can be retired and the cost of servicing it eliminated. This means painfully identifying areas which will not receive reinvestment, and encouraging and assisting the people and businesses that remain to relocate. This will be difficult as these neighborhoods are still the locales for people’s homes and they have a strong emotional sense of ownership. Sensitivity is clearly called for. We need to increase localized density in areas targeted for redevelopment and convert other areas to non-urbanized uses such as nature preserves or agriculture. This will be a long process. Financial Restructuring. Older cities are often hobbled by mountains of debt, underfunded pensions, overstaffed payrolls, and too many municipal fixed assets. The government needs to be right-sized. Federal assistance may be needed to take over pensions and to give cities some tools to restructure unsustainable debt loads outside of bankruptcy. Development Restrictions. In return for federal assistance, there ought to be a real insistence that these cities sign up to the shrinkage programs. This might include enforceable restrictions on their ability to adopt policies that are oriented towards servicing growth such as restrictions on the ability to use federal funding for net new infrastructure. For example, if Detroit wants to build a federally funded rail system, it should retire an equivalent amount of other infrastructure elsewhere to offset it. Participation would be voluntary, but the federal government should make it clear that it will not finance futile attempts by these cities to try to recapture the glory of their pasts. This is of course only a conceptual outline of a program. Significant thought, analysis, and research would be needed to develop a program. Given our lack of experience in the field, experiments should be encouraged, flexibility granted within broad parameters, and real world feedback continuously incorporated back into the program. Clearly, we will not get everything right the first time around. We need to have the courage to learn from our mistakes and not forge headlong into failure simply because it would look like a political retreat. Submitted by sudheerjo on Mon, 10/24/2011 - 03:33. I desire to possess a moment to state what a superb website you might have here. I have been reading your blog for many days and definately will now be bookmarking it for the future. Submitted by vsb on Sat, 06/26/2010 - 09:29. Of course, all of the standard objections to sprawl apply here. The article mentions the enormous infrastructure costs in Rust Belt cities: sprawl actually increases those costs. New sewer systems, water management, electric and gas lines, roads, etc., are constantly being built here, while the old ones languish. Submitted by wannydiesel on Thu, 03/10/2011 - 04:14. Submitted by maroon on Wed, 11/18/2009 - 15:35. There is a serious economical imbalance in Detroit, no wonder a lot of people consider relocation as a way to escape the area. If this trend goes on there won't be much left from Detroit. Submitted by sandrewsmith on Fri, 10/23/2009 - 18:10. I agree with the point that Rust Belt cities need to reduce their footprint. However, this article states that the solution is to bulldoze older neighborhoods, and scatter the remaining populations. There are several issues here. Full disclosure: I live in an older neighborhood in Pittsburgh, which has all of the classic rust belt problems. The older neighborhoods are failing, and the entire metropolitan area has a shrinking population and economy. Paradoxically, the urban area is getting larger. A Brookings Institution study showed that, from 1990 to 2000, metro Pittsburgh's population shrank 8%, while its urbanized area grew 20%. One might ask why there is so much sprawl in a "shrinking" city. Basically, the answer lies in real estate speculation, the economics of home construction versus renovation, and local governments. Pennsylvania's local government system is shattered into many townships, boroughs and cities, all of which have a vested interest in attracting "development". Rural municipalities have an advantage over older ones with low taxes and open space. What makes it worse is the lack of immigration into the older neighborhoods: they are failing because of both sprawl AND the destruction of the metropolitan economy by the steel companies. It strikes me that the answer to this problem is not to bulldoze old neighborhoods, but to stop the sprawl. The resources saved by doing that could be used to revitalize neighborhoods like mine. So, yes, cities like Pittsburgh need to face up to the fact of our lost prestige and the necessity of some form of shrinkage. It would be a huge mistake, though, to hollow out the core, so to speak, when the fundamental problem lies elsewhere. Submitted by jg on Thu, 07/02/2009 - 18:16. This is a nice article. Mr. Renn writes interesting pieces for his BLOG "THE URBANOPHILE." In the short term as midwest and shrinking cities reinvent themselves, the issue of population locating to the outer ring suburbs continues to be a problem. Sure, cities can cut down on FIXED COSTS by eliminating neighborhoods that have all but become abandoned and undesirable, but at the other end of the equation, shrinking city REVENUE, remains problematic. Suburbs growing up outside large central metro areas still rely on those areas for many services - not least of which is international name recognition. Whether or not outer ring suburbs OWE anything in terms of tax to their anchoring cities is debatable - it would help cities temporarily stabalize revenues - but as central cities decay, so too will those suburbs in time. Submitted by save_the_rustbelt on Thu, 07/02/2009 - 12:24. Detroit has several square miles that could benefit by being flattened - until that happens, no chance of redevelopment. Detroit also has many industrial sites, old schools, an old train station, a collapsed book depository, etc. that should be razed. Same for Toledo, on a smaller scale. No redevelopment in blight areas - time for the dozers. Submitted by Aaron M. Renn on Wed, 07/01/2009 - 16:53. Thanks for the comment. Some of the older, historic neighborhoods might be where you'd focus investment. I don't think we write off entire cities, rather we need to concentrate public investment in areas in a manner than can create an impact, instead of trying to peanut butter spread a think film of money around a huge area, accomplishing nothing. The challenge with historic neighborhoods is that there is often pressure from preservation activists to prevent needed change, redevelopment, and densification. This needs to be addressed if we have want to make an impact, or else they will just end up as "wards of the state" type of neighborhoods that are only sustained through extensive subsidization but never generate self-sustaining life or start generating an actual return in tax dollars or economic activity. Submitted by nhelmholdt on Wed, 07/01/2009 - 16:52. The five points you put together in this article are worthwhile, however, I think that a focus on resilient industries should be a central message of any policy at the regional, state or federal level to address shrinkage. Nobody is seriously proposing to rebuild the auto and steel industries to their former capacities. Instead, we should look at industries and sectors that adapt well to change and can recover from adverse conditions. Building infrastructure to support activity in these industries will be essential to providing economic activity in rust belt metro areas. Overall, I feel like this essay is overly pessimistic about the future of cities like Buffalo, Cleveland, Detroit and Pittsburgh. While there is no question that they have lost substantial population and economically viable firms, the human and physical capital that exists in these places can provide the seeds of change. Submitted by Aaron M. Renn on Wed, 07/01/2009 - 17:45. Great point. I think what we need is diversification. That is, we can't expect cities to not suffer problems if they are dependent on just a couple of fairly generic macro-industries. 1. The industry segments typically touted - life sciences, high tech, advanced manufacturing, and green tech - are large, diverse segments in their own right, ones where everyone wants a piece of the pie and where few Rust Belt cities have a differentiated capability. 2. The best segments would be niche segments like the motorsports industry in Indianapolis. What parts of these industries or others can cities serve effectively? Obviously, you can't just central plan a cluster like that, but you can look at what you can do to create favorable conditions. But the problem is that these tend to be small in terms of employment. Indy is a top three site in the world for motorsports employment, and while it has a lot of firms at good wages, it only adds up to around 8,000 employees. Even with multiplier effects, this isn't going to turn a city around. That's why large size is such a millstone for transformation. Every city is different. But looking to build a more diverse economy is definitely important. I think this is where resiliency comes from. I agree that these cities have top notch human capital. But they also suffer from social structures that do not make most effective use of what they have. The Midwest/Rust Belt needs a mindset change to make this happen. That will take courageous leadership. In influx of outsiders would help as well, but I'm not optimistic on that front.